After our amazing visit to the open market in Louhans it was time to start moving. The Canal du Centre was originally built for thirty-meter barges (100 ft.). Back in the early 1900’s the French Government decided to modify the locks so that 38.5-meter barges could use the canal. Rabelo is actually 38.95-meters (128 ft.), so we are stretching the limits a bit. When inside the locks it can get a little tight. Remember this is France, so every lock is not the same size. But on the Canal du Centre it’s the turns that are the real challenge. While they may have lengthened the locks they never bothered to modify the curves along the canal. The section between Chagny and the village of Santenay is one of the more challenging canals we have been on. It was an interesting journey. Some of the turns were so tight at times it didn’t seem possible that we would make it. 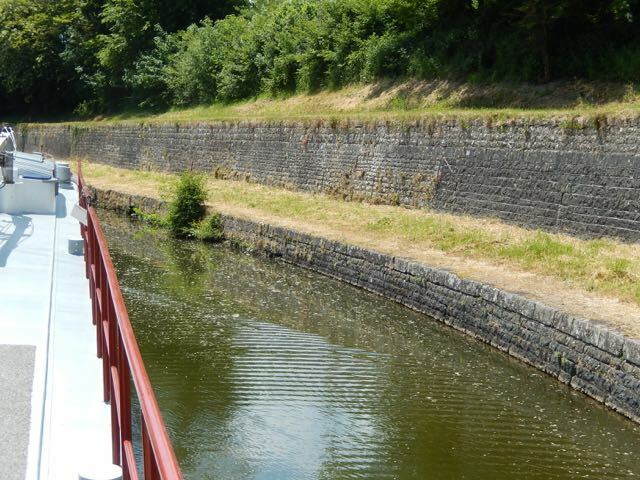 You start to scratch your head when you are coming out of a lock with a little over an inch on each side of the boat, and in front of you is a wall that is less than 39 meters from the lock. The secret is to go very slow, and start turning as soon as possible. 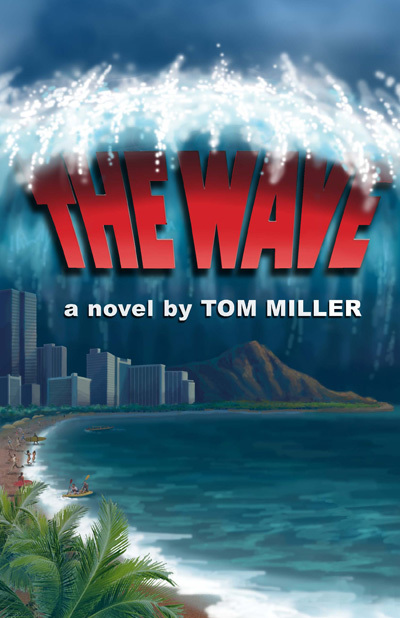 Sometimes the front of the boat will touch the wall, but that’s okay. It’s why they makes steel barges. A tight turn on the Canal du Centre. 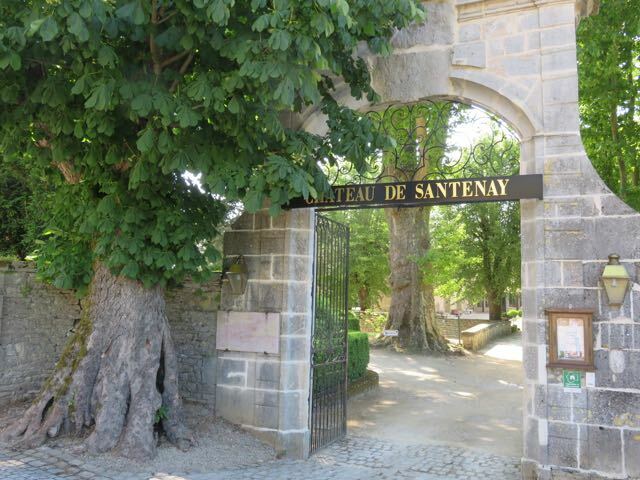 Santenay is known as one of the better Burgundian wine producing regions. While it is not up there with Vosne-Romanee they still produce some excellent wines, and the prices are far more reasonable. 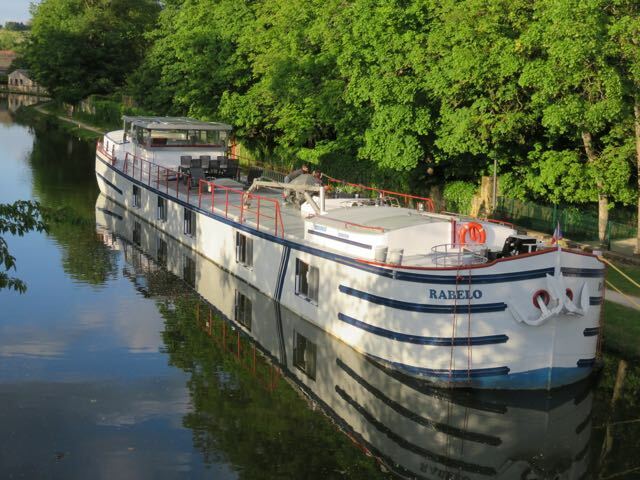 We moored Rabelo in a spot over looking village of Santenay. The walk to town was about a half mile. At Chateau de Santenay we were treated to an interesting tour of the grounds, and wine cellar. We learned that it was important to keep air out of the barrels while the wine was ageing to prevent it from turning to vinegar. 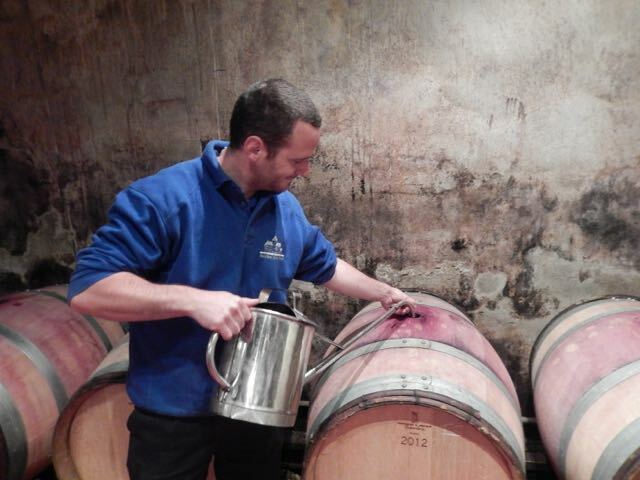 The wine actually evaporates through the oak barrels, and has to be topped off on a regular basis. We were there the day they were topping off the barrels. The entrance to Chateau de Santenay. 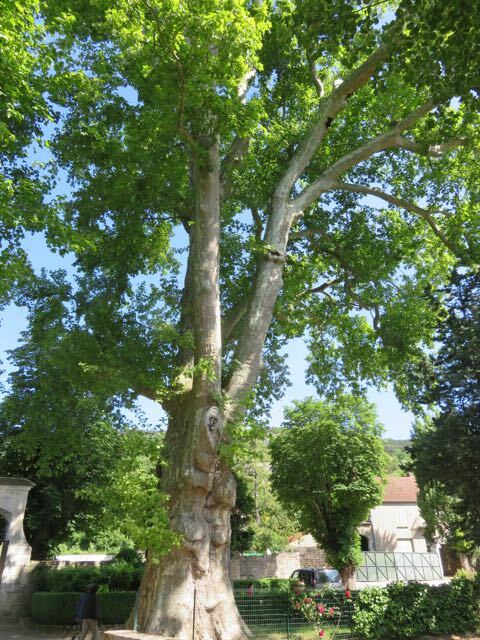 A magnificent 416 year old Plane tree at the entrance to Chateau de Santenay. 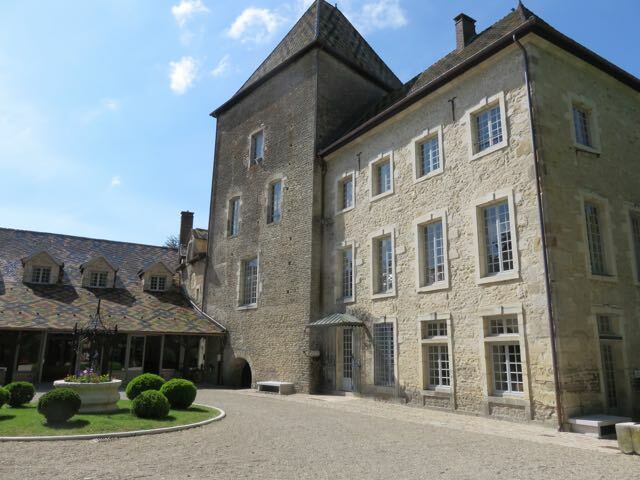 Chateau de Santenay was originally started in the 11th century, and built as a fortified castle that included a moat. Sometime around the 18th century it was decided that the typical castle fortifications were no longer needed. 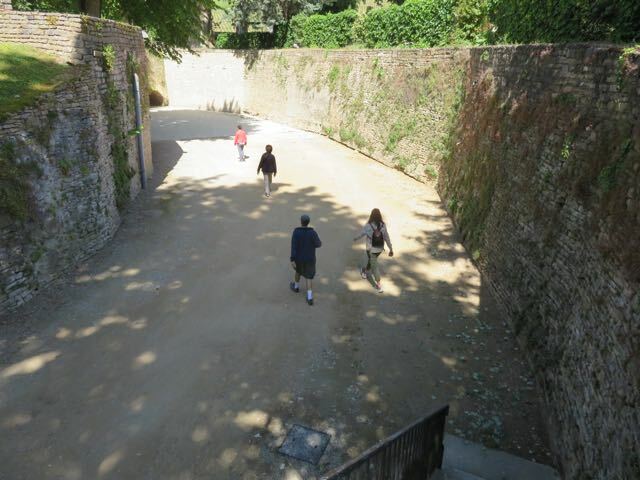 The moat was drained, and more extensive living quarters were built. During the renovations Gallo-Roman artifacts were found on the property, so people have been living there for over 2,000 years. Topping off a wine barrel. The old moat at Chateau de Santenay. I didn’t drink the whole bottle. After our tour we did a wine tasting, and ended up buying six bottles. One of the bottles we bought was a white Premier Cru that was not available for tasting. 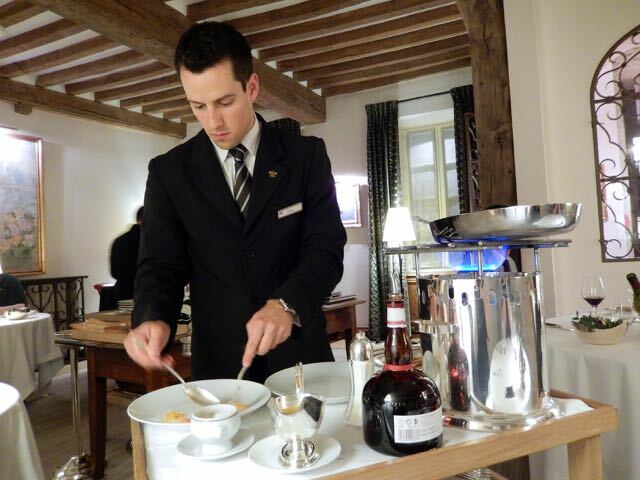 French wines come in four different categories. They are in descending order of quality Gran Cru, Premier Cru, Village and Regional. 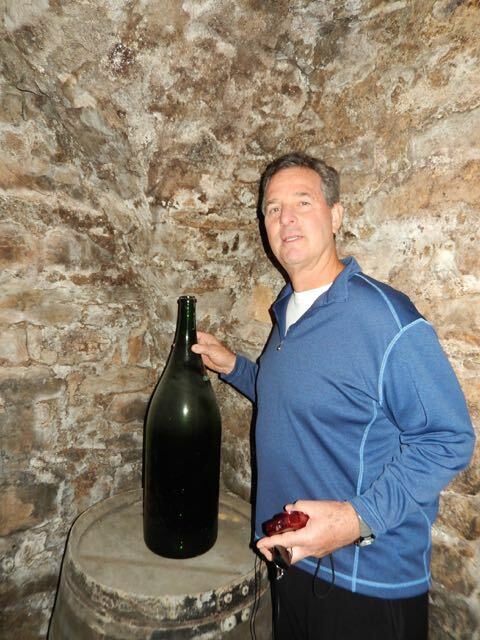 A couple of nights after leaving Santenay we tried the white Premier Cru and loved it. In fact we liked it so much we went back and bought another six bottles. Before we leftChagnyLisa and I decided to make dinner reservations at the three star Michelin rated restaurant Lameloise. Our favorite restaurant up until now had been the two star rated Chapeau Rouge in Dijon, but we’ve never eaten at a three star restaurant.Three star restaurants are few and farbetween, and when they get that third star they can charge a ton of money for their food.In fact they make movies about restaurants trying to get their third star. If you haven’t seen The Hundred-Foot Journey it is well worth renting. Was Lameloise worth the cost of a weekend vacation? That’s hard to say. It certainly was a very special experience. The service, setting and atmosphere were impeccable. The food was excellent, but was it worth the kind of money we spent? I don’t know. We have found that at both Chapeau Rouge and Lameloise what makes these restaurants so unique, the genius, that special quality you never forget is their ability to combine ingredients that you would never think of serving together. The aromas, textures, and layers of flavor in each bite are extraordinary. 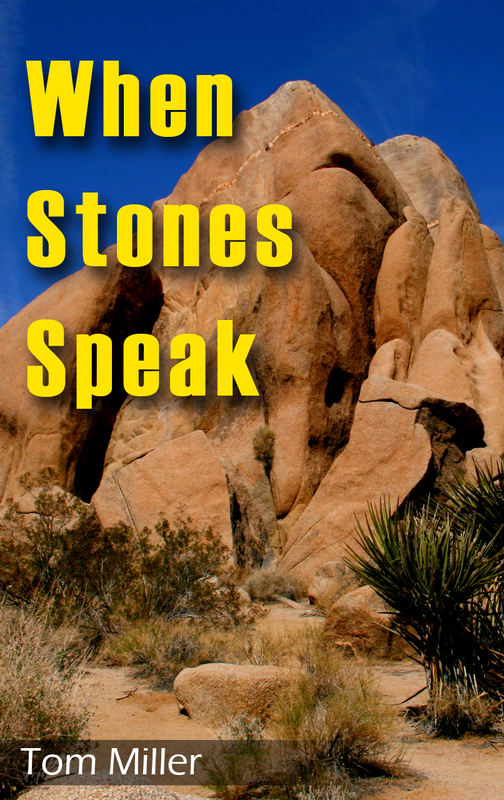 It’s an experience that each individual has to decide on his or her own if it’s worth it. 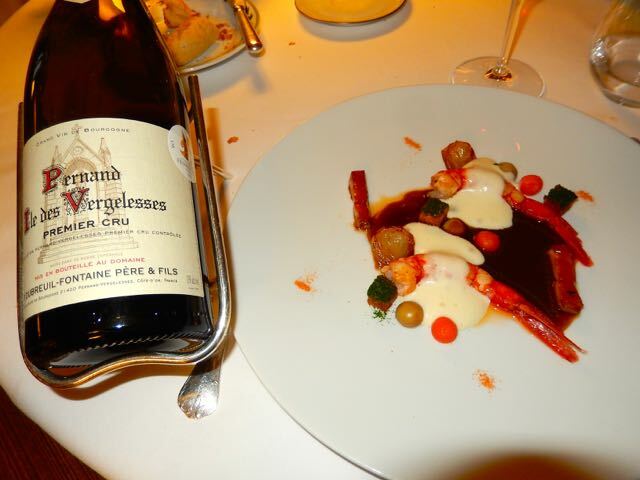 A shrimp course with a bottle from our friends Dubreuil-Fontaine winery. 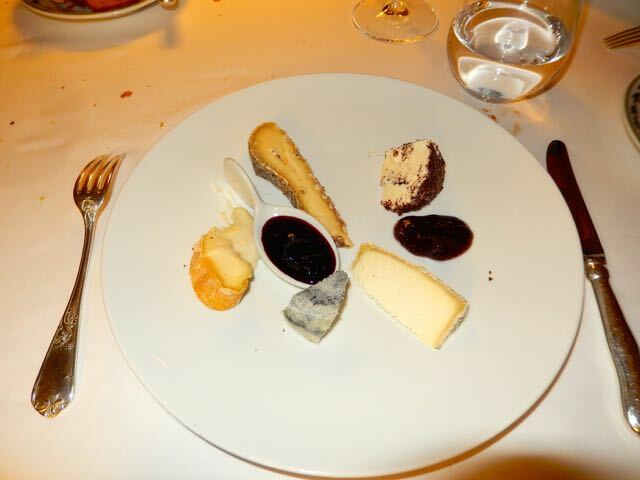 Of course there was a cheese course.